Whether you want to place computers in a secure rack, are contending with cables in a hazardous electromagnetic area, or simply need greater distance between your KVM workstation and your computers. 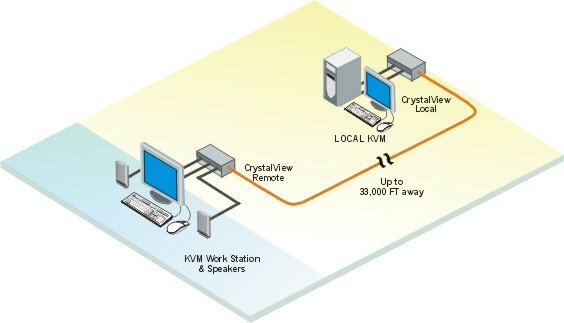 Rose CrystalView Fiber (CRK-2DFS/PC) excels at extending your KVM signals. Units are available as stand alone units or as cards mounted in a chassis. Rose CrystalView Fiber (CRK-2DFS/PC) is perfect for development labs, television studios, kiosks, banks, educational institutions, airports, offices, shipboard, aircraft, as well as harsh industrial environments such as factories or manufacturing plants. Fiber is virtually immune to lightning, power surges, electromagnetic interference, and radio frequency interference (RFI). Since the data sent is digital, you'll always have a clear picture which is not always possible when using CAT5 extenders. Maybe you want to relocate your computer for protection against a harsh environment, an insecure area, or a better place for maintenance. Then again maybe the computers have to stay where they are and it's the operator that needs to be in a control room or at an office desk.